This is the first friend I have ever made, and his name is Moustacha. He is planning a move to the warmer climates of Brisbane soon where he'll be residing with my sister. 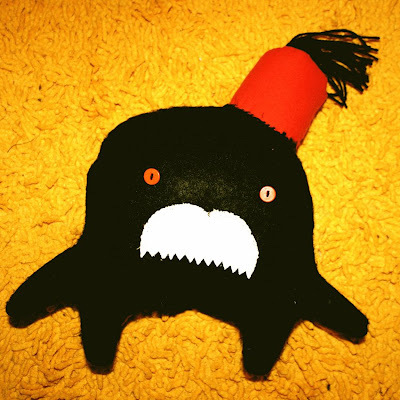 Moustacha is never without his jaunty Fez - he likes lemon lime and bitters, reading the newspapers in the morning with a cup of liquorice tea, the smell of pipe tobacco, and the shape of the African continent. 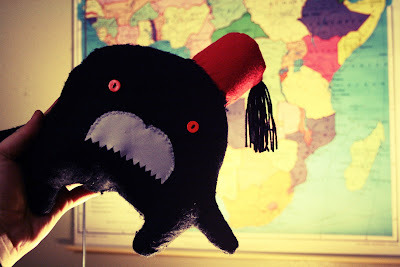 Moustacha does dream frequently about the delightful shape of Africa and he'd quite like to visit it some day. I was about to go onto your blog with the express purpose of telling you to stop having a life and to blog more and it turns out you have! And you made a friend! He's so lovely. Tell him I think he's especially like Mali.